MoreImpending divorce, looming criminal charges or custody battles can overwhelm some people to the point of hopelessness. Legal matters introduce complicated and frustrating circumstances into an individual's life. The quality, aggressive representation offered at Bruce G. Sandmeyer, Esq., helps alleviate the stress and restore peace of mind. 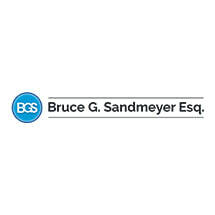 The accomplished legal team at Bruce G. Sandmeyer, Esq., specializes in family law and criminal law, and has the experience and confidence necessary to help...Impending divorce, looming criminal charges or custody battles can overwhelm some people to the point of hopelessness. Legal matters introduce complicated and frustrating circumstances into an individual's life. The quality, aggressive representation offered at Bruce G. Sandmeyer, Esq., helps alleviate the stress and restore peace of mind. The accomplished legal team at Bruce G. Sandmeyer, Esq., specializes in family law and criminal law, and has the experience and confidence necessary to help you achieve the best results. Call today for your free initial consultation. We look forward to assisting you.